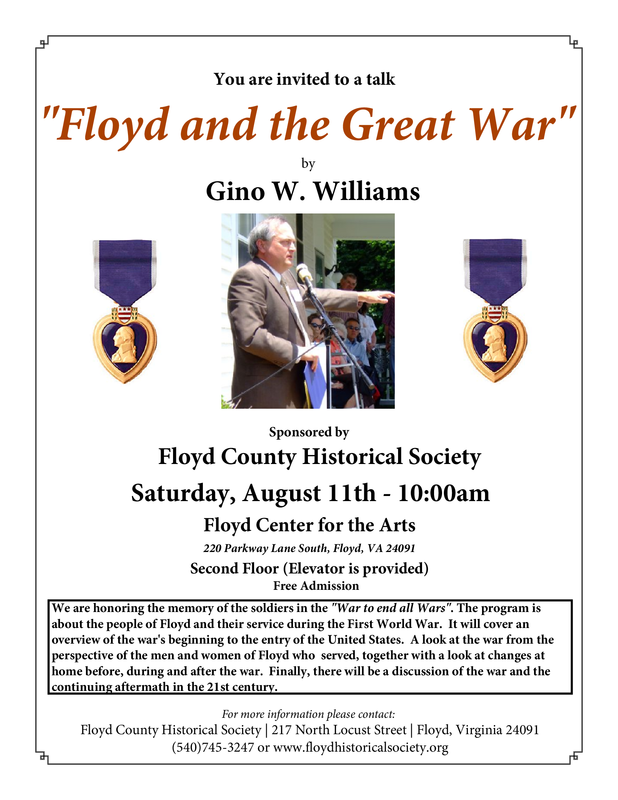 The Floyd County Historical Society presents "Floyd and the Great War", a WWI talk by Gino Williams at The Floyd Center for the Arts. We are honoring the memory of the soldiers in the "War To End All Wars". The program is about the people of Floyd and their service during the first World War. It will cover an overview of the war's beginning to the entry of the United States led by Gino W. Williams. This will be a look at the war from the perspective of the men and women of Floyd who served, together with a look at changes at home before, during and after the war. Finally, there will be a discussion of the war and the continuing aftermath in the 21st century. The talk is on the second floor and an elevator will be available. To view the event flyer, visit: https://i.imgur.com/raw1Wsb.png. For more information, visit: http://www.floydhistoricalsociety.org/next_meeting.html or https://www.facebook.com/floydcountyhistoricalsoc/ or call 540-745-3247.